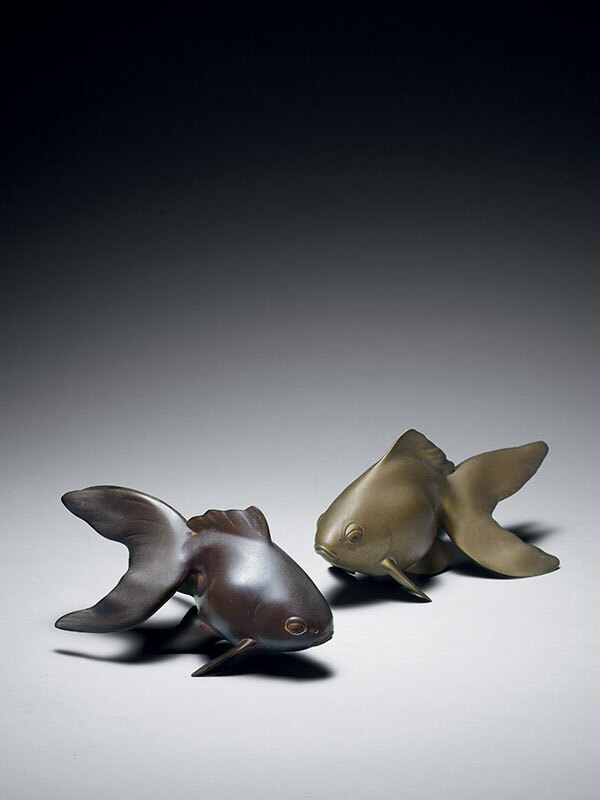 Two bronze okimono of carp. The fish are naturalistically depicted with pronounced tails, fins and dorsal fins, as well as bulging eyes. One fish is patinated a dark brown chocolate colour, the other has a more natural, bronze tone. The eyes of both fish are partly inlaid in a dark metal. The carp are signed with the signature Yasuyuki Yori and contained within the original tomobako, inscribed: Okimono Kingyo (Okimono, Gold Fish). The term okimono in Japanese literally means “object for placement [on display]”.